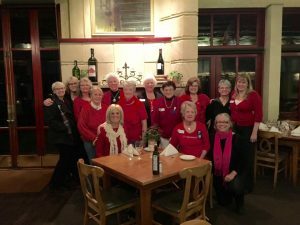 A long-standing community project for Soroptimist International of Calaveras County took place during the month of February 2019. “Take Women to Heart” provided free cholesterol (lipid panel) screenings to 192 Calaveras County women. Partnering, again, with Dignity Health Mark Twain Medical Centers, SICC is so thankful for this partnership, which, for the past thirteen years, has allowed these potentially life-saving screenings be provided. Heart attack and stroke are the No. 1 killers of women in the United States. For women, the odds of dying due to heart disease, heart attack, or stroke are significantly higher than dying of cancer. Testing (blood draws) may be accomplished at the Main Clinic at the Hospital, or at any of the 5 medical clinics of Dignity Health. Congratulations to all the women who have now taken a positive step towards their better health. The lipid panel readings can (and should be) discussed with their physicians to determine if life style changes might be in order or medications need to be prescribed. Thank you to Dignity Health Mark Twain Medical Center for your continued support, which makes “Take Women to Heart” a worthy project for Soroptimist International of Calaveras County and the women of Calaveras County. Soroptimist International of Calaveras County has again partnered with Dignity Health Mark Twain Medical Centers, to offer free lipid panel screenings to Calaveras County women for the entire month of February. If we save the life of only one woman, we have accomplished our goal. More than 157 women took advantage of this screening. They now know the numbers that measure good (HDL) and bad (LDL) cholesterol levels — and the risk evaluation of heart disease. Life changes could improve these numbers if they are above a certain level. Talk with your family physician about the numbers. For the twelfth year, our partners Dignity Health made this project possible. We certainly could not do this without them. Thank you so much for this continuing partnership. Soroptimist International of Calaveras County, for the eleventh year, partnered with Dignity Health Mark Twain Medical Centers, in offering free lipid panel screenings to Calaveras County women during the month of February. These screenings measure good (HDL) and bad (LDL) cholesterol levels and triglycerides for a risk evaluation of heart disease. More than 187 women availed themselves of this valuable test. Sincere thanks to Dignity Health for all they do to make these life-saving tests readily available. And congratulations to the women who took advantage of this opportunity to learn about their heart health. 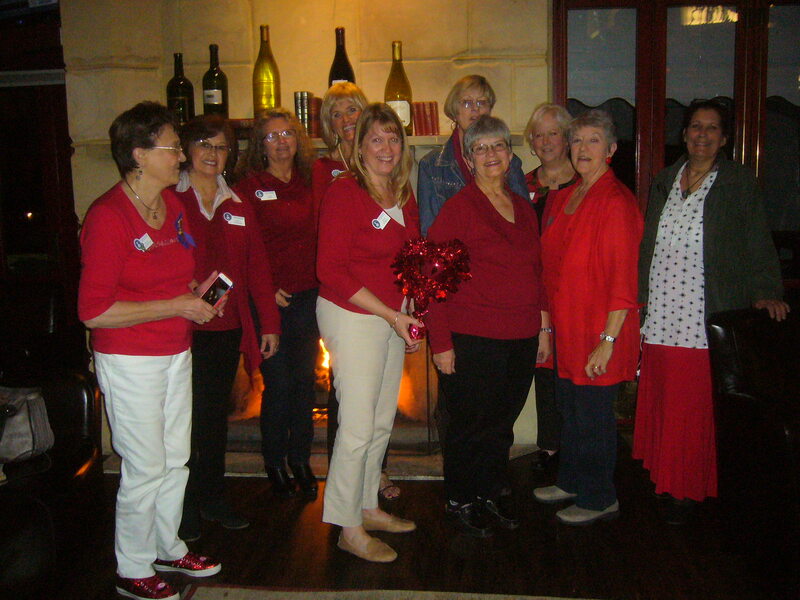 Soroptimist International of Calaveras County again celebrated the American Heart Association’s“Go Red for Women” movement by offering free lipid panel screenings to Calaveras County women for the entire month of February 2016. We have learned that 218 women took advantage of this great opportunity. SICC is excited that so many local women, again this year, took advantage of this unique opportunity to have their lipid panel cholesterol numbers checked. Congratulations to everyone who took these positive strides in learning their risks of heart attack and stroke. You may have just saved your own life! 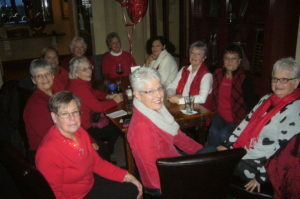 The month of February recognizes the “Go Red for Women” campaign..Several SICC members here all dressed in their best red finery!!! IN 2015, 271 WOMEN TOOK ADVANTAGE OF THIS OPPORTUNITY! 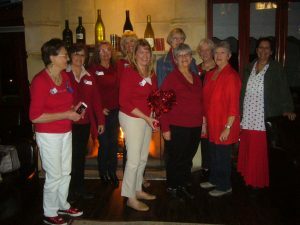 Soroptimist International of Calaveras County (SICC) is again celebrating the American Heart Association’s “Go Red for Women” movement by offering free lipid panel screenings to Calaveras County women for the month of February 2015. Heart attack and stroke are the No. 1 killers of women in the United States. For women, the odds of dying due to heart disease, heart attack, or stroke are significantly higher than dying of cancer. SICC has enjoyed an on-going partnership on this project with Dignity Health Mark Twain Medical Center since 2006. A number of factors go into determining a person’s heart health. Readings of good (HDL) and bad (LDL) cholesterol levels and triglycerides and a risk evaluation for heart disease are a place to start. During 2015’s month-long screenings, over 250 local women were tested. Awareness of personal risk and treatment options can empower a woman to live a long and healthy life. Tests are performed either at Dignity Health Mark Twain Medical Center in San Andreas or at any of the Community Medical Centers located in Angels Camp, Arnold, Copperopolis, and Valley Springs. Testing requires a 12-hour fast and completion of a simple voucher. To support future funding for SICC’s Take Women to Heart project, SICC is hosting a Cinco de Mayo Chili-Cookoff Challenge fundraiser on Saturday, May 2, 2015, at the historic Murphy’s Hotel courtyard. To learn more about the free screening tests and/or the Chili Cookoff, please call (209) 753-9700. Partnering, for the ninth year, with Dignity Health – Mark Twain Medical Center, SICC offered free lipid panel tests to any woman in Calaveras County during the month of February 2014. Over 250 area women participated n this program and learned their risks of heart attack and stroke. Armed with this information, and if deemed necessary, they could then consult their own private medical provider to, perhaps, form a plan of action. To kick off the “February only” Take Women to Heart program, SICC partnered with Dignity Health as well as the American Heart Association to sponsor a new event “Red Shoe Stroll” held at Mark Twain Medical Center campus on February 8, 2014. This event celebrates the “Go Red For Women” program from the American Heart Association. Starting at 8 a.m. participants and their families warmed up with local Zumba dancers and all registered walkers/runners/strollers celebrated a healthy lifestyle by participating in the 5k course. All were encouraged to gather in the MTMC dining room for an awards ceremony followed by a FREE heart healthy expo, healthy cooking demonstrations, appetizers, CPR information, and Cardiac Rehab and other MTMC programs. Several women and men participated in “the Stroll.” Due to inclement weather, a route was developed inside the hospital corridors so the participants could stay dry but still take part in the event. 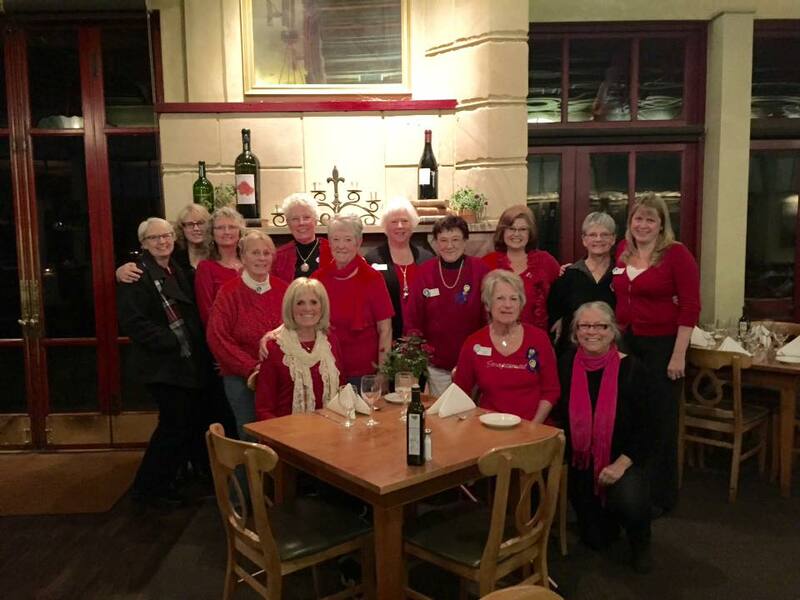 To further celebrate “National Wear Red Day”, a group of Soroptimists and friends gathered at CAMPS restaurant on the evening prior to the Red Shoe Stroll, to build excitement and enthusiasm for the Red Shoe Stroll. April and May 2013 found Soroptimist International of Calaveras County again partnering with Mark Twain Medical Center to offer free cholesterol screening tests to every woman in our county. This was our eighth year of offering these potentially life-saving tests. The final count of women served in 2013 — 482 Calaveras County women took advantage of this opportunity!! The process is simple. Complete a simple voucher at any of the five medical clinics in the county or at the MTMC laboratory in San Andreas. A 12 hour fast is required prior to the blood draw. You will receive, via USPS mail, a summary of the results of the testing. The comprehensive cholesterol testing measures good and bad cholesterol and triglycerides, including a risk evaluation for heart disease and stroke. If the measurements are too high, you should consult with your own private healthcare provider for further analysis and guidance. SI Calaveras County has been fortunate to be awarded grants, over the past years, to help defray the costs of this important testing. Calaveras Community Foundation awarded SICC grants in 2008, 2009 and 2011 totaling $9,000. Soroptimist International of the Americas issued SICC a $4,000 grant in club year 2010/11. At times SICC has designated proceeds from specific fund raising projects to benefit the Take Women to Heart project. The number of women taking advantage of this opportunity appears to be increasing each year. Since 2007, more than 2,000 women have been tested during these two-month periods. SICC is very proud to partner with the MTMC team in offering these blood draws to Calaveras County women at no cost to them. We often hear from women about how thankful they are that we offer these service. At times lack of finances or no insurance coverage prevents women from having these cholesterol screening tests done. SICC recognizes that heart disease is the leading cause of death in women, killing one in four females claiming the lives of almost 500,000 women each year. Awareness of personal risk and treatment options can empower a woman to live a long and healthy life. Every woman should know her risk factors for coronary heart disease and stroke, and speak with her healthcare provider about the prevention of coronary heart disease, setting goals and the best way to achieve those goals. The first step in lowering risk requires measuring and assessing the risk. A cholesterol screening test is an important part of measuring cholesterol (LDL & HDL) and Triglycerides.